Turi Simeti is an Italian artist who played an active role in the Zero art movement of 1960s and 1970s, along with artists like Lucio Fontana, Enrico Castellani, Piero Manzoni and Agostino Bonalumi. Still actively creating today, Simeti is considered a true pioneer, a “maestro,” of 20th and 21st Century Italian art. Simeti was born August 5, 1929 in Alcamo, Province of Trapani, Italy. He left Sicily to Rome in 1958. He began his artistic work in this period, while attending the studio of Alberto Burri was initially inspired by his burned material before his work became purely monochrome. Minimalist in conception, for the last 50 years, Simeti’s work has comprised of dynamic patterns of ovals that dance across the monochromatic surfaces of shaped canvases. This focused combination of color and shape speaks to Simeti’s concern with emphasizing the physical presence of the artwork itself, rather than an expression of the artist’s voice. 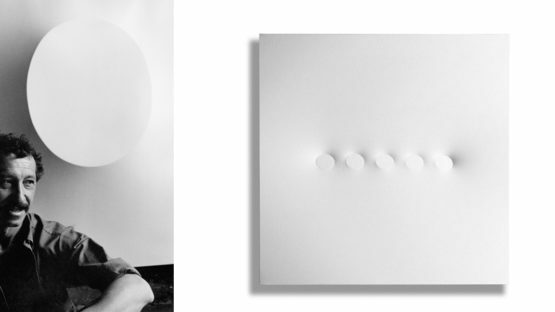 Just as Fontana helped found Spazialismo with his punctured canvases, for decades Simeti has broken through key tenants of minimalism to explore the play of light on shapes created on monochromatic and tactile canvas surfaces. Simeti’s works exist not as single entities but as an active experience of color and shape, and ultimately a capturing of the dynamism that exists between these two aesthetic elements. In the 1960s, he actively participates in major exhibitions organized by spatialist, particularly in New Trend 3, Arte Programmata – Aktuel 65 and ZERO Avant-garde, in the workshop of Lucio Fontana. From the 1970s, his works were exhibited across Europe. In the 1980s and 1990s he spent long periods in Brazil, where he exhibited at the Paco Imperial in Rio de Janeiro (1994). More recently, among the many exhibitions have been devoted to include those of Linde Gallery di Laderburg Hollinger (2011), The Mayor Gallery in London (2012), the gallery Tornabuoni in Paris (2012) and the Art Gallery Dep (2013) in Milan. It was recently exhibited in a group exhibition at the Almine Rech Gallery in London (2014) in the exhibition ‘Pittura Oggetto’, organized by Natacha Carron. Turi Simeti lives and works in Milan, Italy.